Miami Township was originally known as O'Bannon Township, one of Clermont County's five original townships that included Ohio, Pleasant (now part of Brown County), Washington and Williamsburg. They were established on Feb. 15, 1801, by the First Court of the Justices of General Quarter Sessions that met at the first Clermont County seat, Williamsburg. No records have been found that established the boundaries of each township. O'Bannon Township was named in honor of the first surveyor in Clermont County, John O'Bannon. He made the first survey on Virginia Military District land on Nov. 13, 1787, on the site of the village of Neville. The township's name, shortly after, was changed to Miami, after the Little Miami River that had been named after the Miami Indians who once held control of the area. Branch Hill was laid out in 102 lots on Jan. 3,1873, by Col. John H. Branch for whom the village was named. Branch and "Cincinnati Enquirer" editor G. M. D. Bloss, another village resident, were both killed on the railroad tracks, about the same time, shortly after the village began. A post office began here in 1847 and was discontinued for the last time in 1933. Epworth Heights began as the Cincinnati Camp Meeting Grounds. It was an extensive development of the Methodist Church and operated by the Cincinnati Camp Meeting Grounds Association. The first camp meeting took place here the week of Sept. 14, 1874 on the 40-acre plot. Camp meetings many times lasted a week or more and consisted of religious preaching and soul saving. Thousands of people attended these meetings. Many of the people were from Cincinnati with many of them arriving by the Little Miami and the Baltimore and Ohio Southwestern railroads. The first Chautauqua took place here in August 1890. A Chautauqua was described by its founder, John H. Vincent, a Methodist clergyman, as existing to "utilize the general demand for summer rest by uniting daily study with healthful recreation and thus render the occasion one of pleasure and instruction combined." Epworth Heights' grounds contained two auditoriums (one was huge holding 1,500 people), a large tabernacle open on the sides, tennis courts, shuffleboard courts, a corral for horseback riding, canoe launches, a reservoir, a hotel, gazebos, foot bridges, and Saint Paul's Methodist Church. There were many cottages on the grounds for permanent residents and areas for parking vehicles and pitching tents for those just attending events. There were more than 700 lots, the average size being 20-feet by 40-feet. Many of the streets were named in honor of people prominent in Methodist history - Asbury Avenue, Coke Avenue, McKendree Avenue, and Wesley Avenue. Grand Avenue was the main street. World War I was the first major disruption of life, automobiles changed recreation habits, and the Depression, beginning in 1929, brought financial problems. Legal disputes in the 1950s ended the association's control of the land. Clermont County won a court decision that ordered the association to pay taxes on everything except the land on which the chapel sat. Clermont County Common Pleas Court also removed an old clause from the original deed that said if a property was used for any other purpose than religious use, the land would revert back to the association. The association sold it's remaining land holdings and went out of business in 1952. Guinea City existed for a short while as a community. 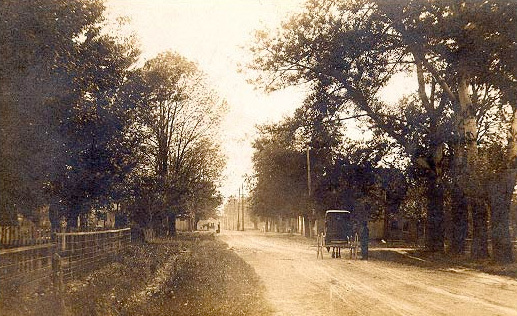 It began about 1870 in the area of the intersection of Branch Hill-Guinea Pike and Paxton-Guinea Road. Four post offices existed here succeeding each other beginning on June 4, 1886, and closing for the fourth and final time on Mar. 15, 1907 when the Loveland post office took over the mail delivery. The largest employer was Felix Motsinger who owned a cooperage here in themid 1800s. Miamiville was laid out by Moses F. Robinson on Sept. 29, 1849. It originally consisted of 17 lots. He opened the first store in town before the year was over. The first industry in the area was the mills of Enoch Buckingham who built them about 1810. John S. and Mark Buckingham built mills in town about 1830; a grain distillery was added about 1835. Other early businesses included two machine shops, a cooperage, a blacksmith shop, a shoe shop and, in later years, a tomato canning plant. The first doctor in town was William McHenry in 1856. It is believed the first tavern opened in town was that of Riley Woodlief in 1850. The first church was the Christian Church that was organized on Feb. 6, 1854, by Elder Thomas Brandon. The Methodist Church may have been begun by disgruntled members of the Christian Church. The village was invaded by Gen. John Hunt Morgan's Raiders early in the morning of July 14, 1863. The Confederate States cavalrymen derailed a train near present Beech Road. The overturned train killed Cornelius Conway, the train's fireman. It is said he haunts the site where he was killed. The Miamiville Cemetery Association was formed on Apr. 10, 1866. Buried in Evergreen Cemetery is Charlie Henry Rich, the man who dealt the "Dead Man's Hand" to Wild Bill Hickok in Deadwood, S. D., on Aug. 2,1876. The Miamiville Special School District was established on Apr. 7, 1876, by an act of the Ohio General Assembly. The school had two rooms for all eight grades and later offered instruction for just grades one-six. Abraham Lincoln passed through Miamivi1le in February 1861 on his way to his inauguration as President of the United States. The Little Miami Railroad began operation in 1841. Today the route is used as the Little Miami Scenic Trail. Mount Repose is believed to have had its beginnings along the old Chillicothe Turnpike (present S. R 28) when it was regarded as a resting place or stopover from the long climb up the hill from Milford. The first business is believed to have begun in 1828 when Mr. Selden began a merchandising operation. A post office began in 1867 and continued until 1907. On the eastern end of town an inn was operated by the Porter family and Jacob Wainwright operated a blacksmith shop. Aaron Condo was a village wheelwright and Charles McGee was the village cooper. Mount Repose was the site of Camp Repose, or Camp Shady, where armaments and supplies were stored during the War Between the States. It was attacked and destroyed by Gen. John Hunt Morgan's Raiders on July 14, 1863. Years later, when construction was going on in the area, cannon barrels and ammunition were uncovered. Originally, the area was known as Newberry when it was laid out by Thomas Shumard in 1818. It consisted of only five lots on the north side of present U.S. 28. The plat for New Salisbury was made on the south side of the road by Thomas Combs on Aug. 22, 1833. It consisted of 40 lots. The first business was begun by William McGrew about 1820; he sold merchandise. In 1831 a post office was established here under the name of Mulberry, probably because of mulberry bushes in the area. The next year a public house, or hotel, was opened by Gabriel Leming. Other businesses located in town were a saw mill, a blacksmith ship, a wagon maker, a shoe shop, a brick maker, a cooperage, a distillery, and a tannery. Mulberry's biggest claim to fame was the exporting of fruit from the many types of fruit trees and vines in the area. It is said Clermont County may have been the United States' major exporter of fruit before Florida became a state and much of the produce came from Mulberry. O'Bannonville received its importance because it was about the midway point between the county seats of Clermont (Williamsburgh) and Warren (Lebanon) on a much-used stagecoach route. The community and O'Bannon Creek took their name from the first surveyor in Clermont County, John 0 'Bannon, from Versailles, Ky., a community he helped begin. Business began to thrive around this halfway stopping point. Cox's Inn attracted most of the travelers. Joshua Cox is said to have settled near Goshen in 1792. Since this area was still in control of the Shawnee Indians, it is more likely he moved to the area after Aug. 3, 1795, when the Treaty of Greeneville, Ohio, was signed that required the Indians to surrender about the southern two-thirds of the present state of Ohio. Regardless, Cox began operation of a mill that also included a distillery that kept his tavern supplied with liquid refreshment. By 1810, O'Bannonville had two blacksmith shops, a wool carding shop, a cobbler, a general store, and a post office. Col. William Ramsey, grandson of the first settler of the area, Col.
Thomas Paxton, purchased 15 acres on which to build a subdivision, but the coming of the railroad changed his plans. A. C. Pickleheimer ran a stone shipping company and O'Bannonville picked up the nickname "Pickleville." The trains ended the stops in town about 1920. Grailville was established here in 1944. It is an adult educational and conference center operated by the Grail, an international women's organization that is an ecumenical movement for women of all Christian backgrounds. It is open to both women and men and offers programs of women, social justice, personal growth, and spirituality. The "main house" was built in 1890. Perintown began with the Samuel Perin's purchase of 14 acres along present Round Bottom Road in 1813. Here, along the East Fork of the Little Miami River, Perin built the first saw mill in the area in 1814. In 1817 he built a small gristmill. 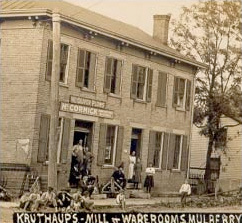 Thus, the community was originally known as Perin's Mills. In 1824 Perin built a tannery that was managed by Enoch Ross. This brought greater employment and business to the area. A distillery was built near the present intersection of U. S. 50 and Pleasant Hill-Wolfpen Road. Additional sawmills were built that supplied wood for the building of flatboats. The flatboats brought Perintown its fame and fortune. They transported flour, salt pork, lumber, leather, and other products as far as New Orleans. 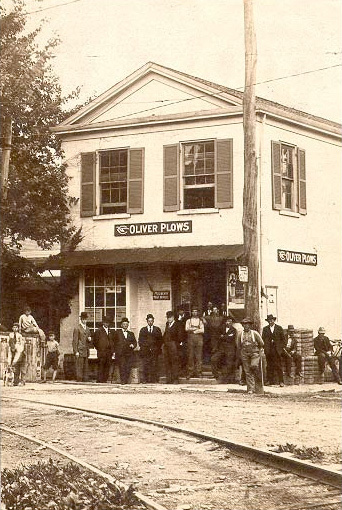 Samuel's son, Ira, operated the overland freight wagons that brought food and other supplies back to Clermont County. Perin's Mills is said to have become, for several years, the largest active market in the area, including Cincinnati. Wheat, corn, barley, rye, and hogs were some of the products. In 1850, the Cahoon family took over the ownership of the mills. Fire destroyed the distillery in 1853 and the gristmill in 1862. In Clermont County, present U. S. 50 was finished in 1806 and was first known as the Anderson State Road; in 1831 it became known as the Milford-Chillicothe Turnpike. Before all this, the Joshua B. Davis stagecoach line came through town. The first railroad came through in 1876 and it was replaced in 1884 by the Cincinnati and Eastern Railroad. The tracks now serve the Norfolk and Southern Railroad. 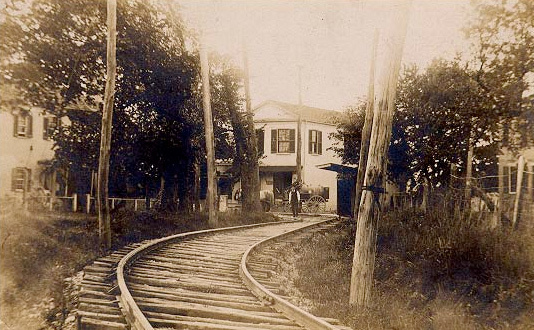 The C & E station was known as the Cahoon Station for the family that owned the property. The station still stands. A traction line, known as the Swing Line, stopped in Perintown from 1910-19. Clermont County's first electrical power station was built near the corner of Binning and Round Bottom roads. It furnished power for the traction lines. To the east of the station was Gravel Beach, a recreation area that was in operation in the early 1900s. Other businessmen moved into town including Mose Elstun, the cabinetmaker, and Samuel Teal, the first blacksmith. Teal was a member of the family of Tealtown Road fame. The first hotel began operation in 1824 under Joseph Cline; it was destroyed by fire in 1965. The first doctor is believed to have been Dr. Williams who arrived in 1835. Samuel Perin built the Methodist Church in 1834, the first church building in town. The present United Methodist Church building was built in 1885 to replace the original that had been destroyed by fire in 1884. Many of the Perins are buried in the cemetery including Capt. Isaac Perin who at 24 years of age died in the explosion of his new sidewheel steamer, Moselle, on Apr. 25, 1838. This tragedy is regarded by many riverboat historians to be the worst river disaster ever. It occurred on the north bank of the Ohio River just upriver from Cincinnati. A two-room schoolhouse was built in 1889 on the NW comer of U.S. 50 and Pleasant Hill-Wolfpen Road. It closed in 1953 to consolidate with the Owensville School District and it was destroyed by fire in 1965. Two stately mansions were demolished in the past 25 years that were of historical significance to Perintown. Samuel Perin's home stood on the SW comer of Round Bottom Road and U. S. 50. (now the site of the United Dairy Farmer store). On the north side of U.S. 52, just west of the United Dairy Farmer's stood the home of Dr. Woodward who had married into the Perin family. His home was built after the Civil War on the site of another home of Samuel Perin. It was demolished in the winter of 1999-2000 to make way for future development. A school building was located in the back of Dr. Woodward's home. Pleasant Hill began in the area of the present intersection of Pleasant Hill-Wolfpen Road and S. R. 131. It is believed it received its name from the pleasant location atop this Miami Township Hill. By about 1820 a Methodist Episcopal Church had its beginning in the area. The recently used name of Day Heights came about because the Day family moved to the area and became well-known farm land owners in the early 1960s. Pleasant Hill-Wolfpen Road is believed to have received its name from the connection of the road between the community and a pen (den) of wolves that lived in the hills at the south end of the present road. This community once stood at the intersection of Ward's Comer Road and Branch Hill- Guinea Pike. It was named after several families of Ward that moved here probably in the early 1800s. The area was known as Ward's Comer at least by the Civil War. A skirmish between local men, led by Lt. Paxton and Sgt. Ramsey, and Gen. John Hunt Morgan's Raiders took place here on the morning of July 14, 1863. One of the Confederate cavalrymen was wounded in the neck and died and was buried here (site unknown). Morgan is said to have warned the local citizens to give his soldier a decent Christian burial or he would return and wreak revenge. Paxton and Ramsey were descendants of Loveland's first settlers.